For the third-straight race, it will be a short field for the Monster Energy NASCAR Cup Series as just 39 drivers will fill Sunday’s 40-car field. Returning to competition are two Open teams. The first is Premium Motorsports’ #55 with Reed Sorenson slated to drive (Derrike Cope, with returning sponsorship from StarCom Fiber, will move to the #15). The other, Rick Ware Racing’s #51, will hit the track for the first time since Indianapolis. As at Indy, B.J. McLeod will drive while road ringers run his cars in Mid-Ohio. The #51 will carry sponsorship from Corrigan Oil, which was also set to sponsor the car when the series last came to Michigan before the team withdrew, and the brand moved to Premium’s #15. As BK Racing now contends with a tax lien issued against the team on August 4, the team still has its two cars entered this week. Brett Moffitt, who collided with Kevin Harvick on pit road in his Cup return last Sunday, will return to the Open #83. Moffitt could be one to watch on Sunday, as he scored his first Truck Series win at the track just last year. Both Moffitt and teammate Corey LaJoie in the #23 will carry sponsorship from JAS Expedited Trucking. Jeffrey Earnhardt returns to Circle Sport with The Motorsports Group for the first time since he equaled his season-best 26th-place finish at Daytona with a determined run at Indianapolis. One week after a difficult Watkins Glen weekend where Boris Said was sent to a backup car in his final start, Earnhardt will run the familiar green-and-white Hulu colors on his #33. Earnhardt finished 35th here in June after a race-long battle with Reed Sorenson at the tail end of the field. Great job by Michael McDowell and the Leavine Family Racing team. Not only did McDowell finish 12th last Sunday, his best Cup finish on the track, but the team returns to Michigan with three consecutive Top 20 finishes. Driver and team finished 23rd here in June. Also turning heads is Chris Buescher, 11th at The Glen, who has finished 19th or better in five of the nine races since Sonoma (a late crash left him 36th at Michigan in June). Last but not least, congrats to Daniel Suarez on his first stage win - and first Top 5 - with a 3rd on Sunday. The run by the Joe Gibbs Racing driver has drawn more attention to the rookie’s streak of four consecutive finishes of 7th or better (he ran 24th at Michigan in June). The XFINITY Series continues its road course stretch to the Mid-Ohio Sports Car Course on Saturday, where 41 drivers are entered to attempt the 40-car field. Among the entrants is Morgan Shepherd, who withdrew his #89 Chevrolet prior to qualifying at Watkins Glen. Missing from the list is Jeff Spraker’s #25, which missed the show at The Glen with P.J. Jones. New to the list this week are two teams which have run partial schedules in 2017. Precision Performance Motorsports is back with Anthony Kumpen set to make his first XFINITY start since a solid 22nd-place finish in the #46 back at Daytona. JD Motorsports has brought back its fourth car, the #15, and team owner Johnny Davis has shuffled his driver lineup. Sheldon Creed, who finished 16th and 27th in the last two Truck Series races at Eldora, will climb aboard Davis’ #01 for his XFINITY Series debut. Harrison Rhodes, who was originalky moved to Davis' "start and park" #15, tweeted on Thursday he will not race at Mid-Ohio and return at Bristol. Mid-Ohio was to see the return of Obaika Racing, the elusive two-car operation we haven't seen hit the track since they reportedly arrived too late at Bristol in April. After a handful of entries with the #97 and Stephen Leicht, on Tuesday the team entered their second Vroom! Brands Chevrolet, the #77, with Ohio native Gregory Vandersluis getting a chance to race at his home track. Vandersluis, who will aim for his XFINITY debut on Saturday, had been counting down to his debut since he first tweeted it on April 21, though the car wasn't originally on the preliminary entry list. Unfortunately, Obaika then withdrew on Thursday, leaving Vandersluis without a ride. 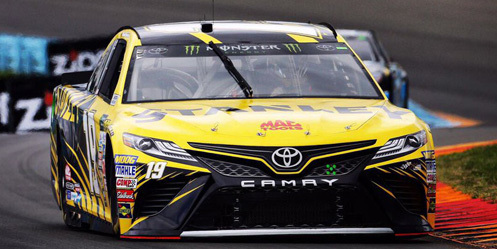 With the Cup Series racing in Michigan, Joe Gibbs Racing also touts a different driver lineup. While Matt Tifft remains in the #19 Akron Community Foundation / Acquire Investment Toyota, the #18 Interstate Batteries Toyota goes to Regan Smith. Smith, whose “baby watch” duties for Denny Hamlin at The Glen weren’t needed, won this race two years ago for JR Motorsports, and will make his first start for Gibbs. Completing the Gibbs trifecta is Always Evolving’s Pirelli World Challenge driver James “J.D.” Davison, who most recently drove in relief of an injured Sebastien Bourdais in the Indianapolis 500. Davison made his XFINITY debut last year at Road America, and finished 19th in Mario Gosselin's #90. This week, he climbs aboard Joe Gibbs’ #20 SportClips Toyota, and will again be one to watch. Gosselin is himself entered in his #90 this Saturday, one week after Brian Henderson finished 34th with ignition problems at The Glen. Another "road ringer" on the list is 2011 Cup Series Rookie of the Year Andy Lally, who had a hard crash in the IMSA race at Road America just last week. Like Davison, Lally impressed in his own road course starts for Mario Gosselin, finishing 7th in this race last year and 15th at Road America the year before. This year, he joins SS Green Light Racing, a team with which Lally scored another 7th-place run at Road America in 2014. The white-and-orange #07 Chevrolet resembles Alan Kulwicki's iconic Hooters Ford, though will carry sponsorship from Branson Supply. B.J. McLeod Motorsports keeps its Watkins Glen driver lineup this week with Stephen Young in the #78 Wealth Recovery International Chevrolet (36th at The Glen), and Josh Bilicki (28th) in the #8 Prevagen Chevrolet. Also remaining the same is Veterans Motorsports, Inc., which will keep Cody Ware in the #74 Dodge. One driver not returning is Kyle Larson, last at The Glen on Saturday, as defending Mid-Ohio winner Justin Marks will drive the #42 BBR / Jason Aldean Chevrolet for Chip Ganassi. In fact, none of the eight Cup regulars who ran Watkins Glen are entered. Meanwhile, at Penske Racing, Sam Hornish, Jr. returns for his third XFINITY start of 2017. After two disappointing finishes of 37th and 34th after two crashes at Iowa, the IndyCar champion returns to a track where he won two of the last three poles and finished runner-up to Justin Marks last year. It will be his first start in the event for Penske since 2013, when he finished 3rd behind A.J. Allmendinger and Michael McDowell. After entering Chevrolets, Toyotas, and Dodges, Motorsports Business Management will field a Ford for the first time, as Ford driver Tim Cowen will run Carl Long's #40 with sponsorship from Cowen's trucking company. The 58-year-old Cowen has four XFINITY starts to his credit with a best finish of 18th in his series debut at the Mid-Ohio course in 2014. Joining Cowen at MBM is Mexico Series driver Enrique Baca in the #13 Toyota. Baca made his debut at The Glen last week in MBM's #40 and finished 31st. For the second-straight race and the fourth time in 2017, there’s going to be a short field in the Truck Series. 30 drivers are entered to attempt Saturday’s 32-truck field. Missing from the Pocono entry list is Bolen Motorsports, whose #66 finished 15th that day with Justin Fontaine. Returning after withdrawing at Pocono is Beaver Motorsports, which has Josh Reaume back in the #50 Chevrolet. Kyle Busch is the lone driver pulling double-duty with Cup, and is entered in his #51 Textron Off Road Toyota. As with most of the lists this summer, the Michigan field will include two trucks each from both Norm Benning and Jennifer Jo Cobb. Driving the second Benning truck, the black #57 Chevrolet, is ARCA driver Mike Senica, who trailed his last time out at Pocono. Running alongside Cobb in the #0 Driven2Honor.org Chevrolet is Ray Ciccarelli, who struggled in his series debut at Eldora after several late-race spins. Pocono saw AM Racing combine its own efforts with the #44 team, which up to that point had been shared by Martins Motorsports and Faith Motorsports. The relationship with AM continues at Michigan, where Austin Wayne Self will again drive the #44 Don’t Mess With Texas / AM Tecchnical Solutions Chevrolet. Self finished 16th with the team at Pocono. Mike Mittler and D.J. Copp continue to trade drivers as well. Todd Peck, whose last three starts came in Copp’s #83, is this week entered in the second Mittler truck, the #36 Chevrolet. Monster Jam driver Camden Murphy, who drove for Mittler, is now entered in Copp’s #83, which still carries Peck’s sponsorship from Pulse Transportation and the National Arthritis Foundation. 2003 series champion Travis Kvapil remains in Mittler’s primary #63 Chevrolet. Like Benning’s #57, MDM Motorsports’ #99 Chevrolet didn’t have a listed driver on the preliminary entry list. That all changed on Tuesday, when Darrell Wallace, Jr. revealed he would be behind the wheel with sponsorship from Maestro's Classic. It will be Wallace's first Truck Series start since 2014, when he scored four of his five series wins. After a solid four-race stint in Cup this summer, he will certainly be one to watch. Ryan Truex’s 3rd-place finish at Pocono was the second-best of his career, and his best performance since he followed Johnny Sauter to the checkered flag at Dayotna just last year. Truex finished 23rd in his lone series start at the track last year, and will again look to impress in his #16 Hino Toyota.